Ok.. So I do have to share one little thing with all of you, because it has been driving me insane! But first... I will give the update on my little baby rats :)! Like I said, very very small! I am very sad to tell you that the other baby passed away yesterday. This one seems to be growing well and I am hoping everything will be ok! I have not named it yet but, I do have happy news! It's a boy! I feel like a mom kinda :). Maybe not as much responsibility but just as much love! Here are some pictures! Once my little baby starts to get fur I will post some more pictures for all you. A little info: Because I know some of you don't know much about rats..
And now look very closely at the picture below. I made mom mad because I wouldn't give her the baby. She ended up grabbing the baby and running! You can see the babies feet where the arrow is pointing. (Don't worry! the baby is ok! It dosent hurt them when mom carries them! So I was talking about something that has been driving me insane.. Well I love getting winners reactions when I email them. Sometimes there like.."no way no way!! woo!" And I just like knowing that I make some of you so happy. But about a week or 2 ago I drew a winner and I sent her the confirmation email. She didn't say Thank you, all she did was provide me with her info. I was a little upset at first but then I told myself not everyone is the same and some people don't get as excited as others. Now I think I know why because the lady who won ( I will never mention names) is spamming my email like crazy. Just a little message to her- Please quit! I will not click on your spam! I hope none of you ever experience this! It's to nerve wrecking! Hey Amanda, are you sure it was the gal that wasn't so happy about the win? I've had someone hack into my email so I had to set up a new one. Do you think my hacker could of been your spammer? Just a thought. I don't understand why people have to mess with peoples emails accounts. And my email subs keep changing,like increasing and decreasing kinda!!! BAck to the main topic, ur little baby, who's gng to be a snowhite soonnn will be adorable!!! Ahh a name for him...i am so excited to see mama carrying baby , coz i had a cat who did exactly the same!!! am looking foward to ur pics when baby boy gets bigger!!! Ok i dont wanna take too muc of space here gurl but so wanna tell u that got my first blogovertise offer, but couldn take it, coz simply cant post! Hoping to be able to put up a post today!!! ANd will have to put up with this laptop till i get another one or get some1 to sort this prob, whichever earlier!!! I love ur giveaways ,but these are the little posts i love more!!! About d life of the wonderful gal behind this super blog!!! Now with so many comments here, does it sund like im spammin:-),he he he...nope its the real me!!! haha Mia, we know your not spamming! Your comments are way to genuine! Thats terrible you couldn't accept! Hopefully once your computer is fixed up the company will still work with you :D.
AND OH MY GOSH! Thats so cool you had squirrels! I want one soo bad! I was like this far away ---- to getting an albino flying squirrel. There so neat! wow that baby is so tiny! how cute!!! lucky they have you to take care of them! The babies are so cute!!! I can't believe that they're so little. With the contest winner- Honestly, I've only entered a couple. One for Liz Leonard Designs and was kinda sad when I lost. But it's a lotto right? I'd be ecstatic if I won something. It really shows that the blogosphere has become nothing more than contest and winners, no thank you or how are the kids? It makes me sad. I'd like to see more heart warming stories on my blog reader but instead I scroll through hundreds of contests. OOO that is a small little baby-no wonder Momma was a bit mad :) Thats her last left, so she is really gonna be protective! You know the person who didnt thank you to give the benefit of the doubt could have had a language barrier... the email spam is a whole dif story- yahoo and some others were hacked and it send emails to all in addy book. 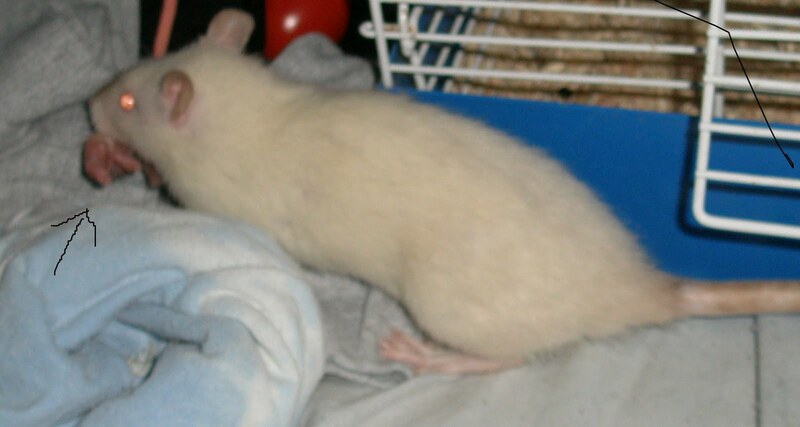 Super cutie rat baby! awwwww, thanks for sharing the pics! Wow, I never even considered ending up with spam from a winner. that's crazy!!! Just found your blog through the Touch'd reviews linky! I'm now following you and look forward to reading more. Would love for you to spot by and follow me as well. Thanks for following I am now following you back from FMBT. Following back from FF. :) I like the pic of the baby with the computer mouse. LOL Thanks so much for visiting!! !